We all know how Wikipedia works – the definitions and descriptions can be changed by the public at large. 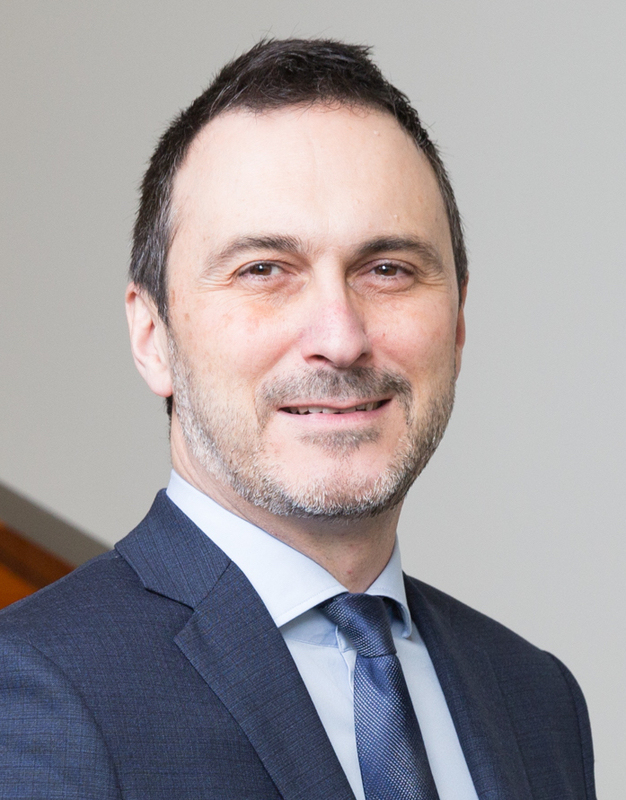 Now, Marianne Skolek has defined Purdue Pharma for all the world to see – and in her view, her recent entry helps to set the record straight about its OxyContin marketing. Skolek, you see, holds Purdue responsible for the 2002 death of her 29-year-old daughter, who was prescribed the painkiller for a herniated disk and wound up dying of heart failure, leaving behind a 6-year-old son. And she remains unsatisfied with a plea deal last year in which Purdue Pharma and three present and former execs agreed to pay $634.5 million to settle charges related to deceiving docs about the potential for abusing OxyContin. No one went to jail…. The details of the case — including especially Purdue’s dangerously deceptive marketing campaign — are shameful. It’s also a good example of how, in the age of the Internet, a single really angry person can take a huge, visible slap at a mighty company. Not surprisingly, the Wikipedia page for Purdue has now been edited (less than a day later). Skolek’s edits are gone. 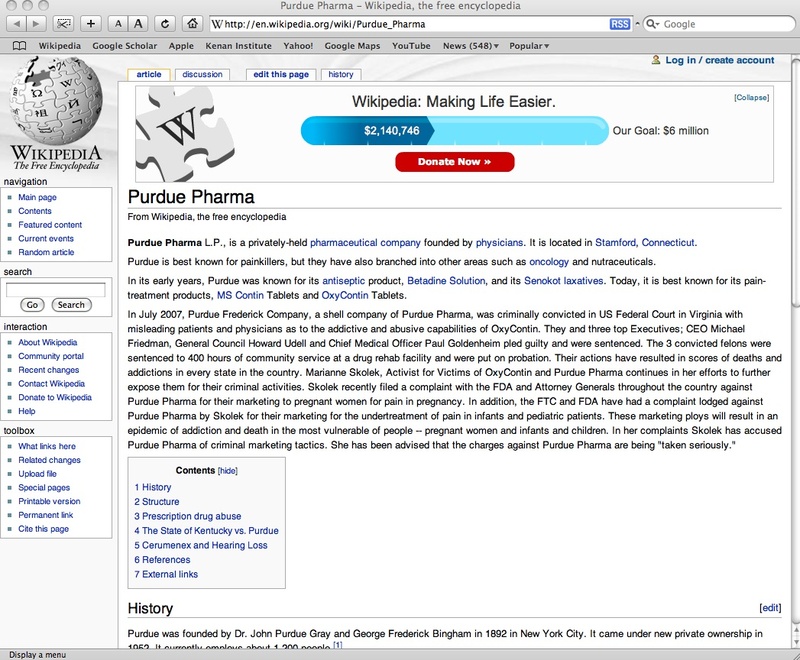 But you can still see what she wrote via the screen-cap I grabbed this morning: Purdue Pharmaceutical, Wikipedia. I would like to be put in touch with Marianne. I think she has some things to teach me….another mother of a child dead from prescription drugs. Sorry, I have *no* idea how to reach her. Lest any corporate conspiracy theories spring up around the redaction of the Wikipedia article, an examination of the history tab will show that Ms. Skolek’s changes to the article were properly reverted by Wikipedia administrators (though any Wikipedia editor would be equally justified in making the changes). Wikipedia is neither an advertising service nor a soapbox; all editors are expected to strive for a neutral point of view. I applaud Ms. Skolek’s efforts to seek justice for her daughter, but Wikipedia is not the appropriate place to do it. David — I recognize that Wikipedia may not be the “appropriate” place to accomplish my goals of preventing Purdue Pharma from marketing for pregnancy pain and for the undertreatment of pain in infants and pediatric patients. But I gave up being “appropriate” when dealing with the criminally convicted Purdue Pharma whose marketing activities have resulted in an epidemic of OxyContin deaths and addictions in every state in the country. It’s interesting that my Wikipedia “setting the record straight” on Purdue Pharma was in place for over a month and a half before it was pulled. I have no doubt that it was Purdue Pharma generated.